Genesis 6:4 There were giantsin the earth in those days; and also after that, when the sons of God came in unto the daughters of men, and they bare children to them, the same became mighty men which were of old, men of renown. 1 Chronicles 17:21 And what one nation in the earth is like thy people Israel, whom God went to redeem to be his own people, to make thee a name of greatness and terribleness, by driving out nations from before thy people whom thou hast redeemed out of Egypt? Psalm 46:8 Come, behold the works of the Lord, what desolations he hath made in the earth. Psalm 58:2 Yea, in heart ye work wickedness; ye weigh the violence of your hands in the earth. Psalm 113:6 Who humbleth himself to behold the things that are in heaven, and in the earth! Psalm 119:19 I am a stranger in the earth: hide not thy commandments from me. Psalm 140:11 Let not an evil speaker be established in the earth: evil shall hunt the violent man to overthrow him. 2 And again I raised mine eyes towards heaven and saw a lofty roof, with seven water torrents thereon, and those torrents flowed with much water into an enclosure. 3 And I saw again, and behold fountains were opened on the surface of that great enclosure, and that water began to swell and rise upon the surface, and I saw that enclosure till all its surface was covered with water. 4 And the water, the darkness, and mist increased upon it; and as I looked at the height of that water,that water had risen above the height of that enclosure, and was streaming over that enclosure,and it stood upon the earth. 5 And all the cattle of that enclosure were gathered together until I saw how they sank and were swallowed up and perished in that water. 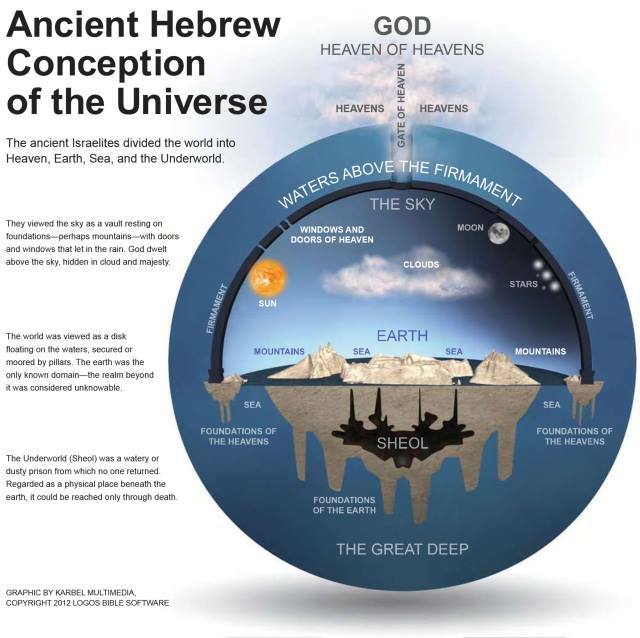 Note that Isaiah asked if you have not heard and known from the beginning that the world is constructed as a “circle” within a “tent.” This is because the whole “Flat Earth psyop” began with Moses writing “In the beginning…” and then telling us about a firmament that was created to separate the waters above from those beneath and that the dry land appeared within it – all before He placed the sun, moon and stars IN the firmament (not outside and all around it – sorry Kent Hovind). The evidence is more than overwhelming that the Holy Spirit inspired Biblical authors all wrote with the exact same cosmological worldview in mind. And sorry, but it most certainly was not that of a spinning, heliocentric, globular earth, in an average galaxy, among billions of other galaxies in an ever expanding Universe. Lexicon of the Bible” by Jeff A. Benner. pictograph) is a picture of the tent door. regarding Psalm 19 or not. Your interpretation is error! I read in one of your posts that you are aware of Bullinger’s “Witness of the Stars.” Bullinger is relating via his book the “speech,” the “language.” the “voice,” the “knowledge” which the constellations and stars are TELLING all those humans who have been given the constellation messages via their star NAMES. Did you ever research “Mazzaroth”? Once a year THE SUN SPENDS TIME AGAINST THE BACKGROUND of each of the 12 constellations of the “Mazzaroth” / the Zodiac constellations. If you EVER get your mind around how it is that the Sun spends a month against the background of each of the 12 “Mazzaroth” constellations, you will have your PROOF that the Earth is in an orbit AROUND THE SUN, once every year / every 12 months. As the Earth moves AROUND THE SUN in its orbit, the Sun is monthly in front of one of the “Mazzaroth” / 12 Zodiac constellations. We, observers on Earth, CANNOT see the constellation which is BEHIND THE SUN, because the SUNLIGHT prevents our seeing that constellation. BUT, during our NIGHT TIME, we CAN view the constellations which are OPPOSITE the constellations which are hidden by the Sunlight. Rob, you know that the night time constellations CHANGE over the 12 months of the year. The reason for the change is the orbiting of the Earth AROUND the Sun. It would REALLY help you to get a grasp of how to interpret the Old Testament terminology if you would force yourself to attempt to digest Jeff Benner’s teaching videos concerning how the meanings of the Hebrew words are derived from the meanings of the combined Hebrew letters contained within each of the Hebrew words. I am truly amazed at how you can write the above and still miss the GLARINGLY obvious errors in your interpretations. For instance, the letter “beyt” meaning a tent (or a house). Right there, you have an ENCLOSURE!!! And yes, I do have a pretty good grasp on how the letters contribute to the overall meanings of words. Such as the use of “beyt” being a picture of a house/dwelling/tent – and how this letter contributes to understanding the firmament as well as the Earth as an ENCLOSED system. As for the Mazzroth, yes, I have studied it at some length. But the stars that make up the “Zodiac constellations” are placed > IN < (beyt) the firmament, which encloses everything AS A TENT! And like the sun and moon, they all move over the STATIONARY Earth. Your interpretation(s) ignore the CONSISTENT descriptions of the cosmos from Genesis to Revelation, the authors of which being in 100% unanimous agreement in their descriptions of the Earth as circular, still, flat, set on pillars and under a dome, within which the sun, moon, stars (including the Mazzaroth) were placed on Day 4 of Creation. NOT ONE single Biblical text even remotely supports ANY notion of a globular Earth, spinning or orbiting the sun. Over 60 Scriptures describe the motion of sun, moon and stars. ZERO can be used to support any concept of the Earth in motion around that which didn't even show up until 3 days after the Earth was already in place. With all due respect to Jeff Benner, if he denies what I've just said, his teachings are not only in gross error, but are in absolute denial of the entire ancient record to include that of the Holy Spirit inspired Hebrew authors of the Biblical narrative. And I'm sorry, but to suggest otherwise is to prove extreme ignorance of the facts and reveal excessive amounts of cognitive dissonance combined with an unhealthy dose of wishful thinking designed to capitulate to what we think we know from monkey-man science. Here is a trump card that neither you nor anyone else can defeat: Stand on a ball. Or get a toy action figure and put it on a ball. Or build a model in 3D of someone on a massive ball. Scale either one to your heart's desire. Scale will make NO difference. One thing you will find as an absolute every time is that it is IMPOSSIBLE for the horizon to ever be at eye-level for a person looking directly straight ahead on a ball. Can't be done. Don't believe me? Try it and see. And then to further obliterate your fantasy, go ahead and try rising up on the y-axis off the ball and see if you can get that horizon to rise with you. IT - CAN - NOT - BE - DONE! The English word “science” has no Greek term meaning what the English term means! The Greek term γνῶσις gnōsis, gno’-sis; from G1097; knowing (the act) does NOT MEAN what modern day “science” is all about! Thank you Rob for all the time and effort and for being strong enough to put all you’ve discovered out there for all to see. The idea of a flat earth has made Enoch and the Bible understandable. I had many questions after reading both. I took the Words that Yahuah gave to be what was meant. They didn’t make sense until I stumbled on the flat earth. I asked for discernment and wisdom and I sure did get it. Unfortunately it’s hard for others to believe that a lie could be so big and a secret kept so well. Let those that have eyes to see. Bless you and never give up.